It is hard to see where consumers' cash will come from. The savings rate is low. Credit is scarce. Mortgage equity withdrawal, which averaged $150bn a month for the past five years, was just $10bn in each of the first two quarters of 2008, Creditsights says. Wage growth is running at just 2 per cent, while 1.2m fewer people are employed compared with last December. Consumer confidence has shown its greatest collapse of the post war period. Happy Thanksgiving. For some more up-to-date, though no less relevant, Thanksgiving-based comic relief, you can take a look at Sarah Palin's now infamous turkey-massacre interview here. And George Bush pardoned his last Thanksgiving turkey yesterday, and there's got be a joke in there somewhere. Time magazine offers up a brief history of Macy's Thanksgiving Day Parade, whilst EarhCam is going to be streaming the event here. And President Elect Obama? Handing out food to the needy, as if you had to ask. And finally: the Boston Globe looks at the historical development of Thanksgiving celebrations with reference to Sarah Josepha Buell Hale, author of Northwood (1827) and "Mary Had a Little Lamb" (1830), also known as "the Mother of Thanksgiving." ShelfLife@Texas is a space for book lovers to discuss literary news and events at The University of Texas at Austin. Public affairs professionals from across campus will blog about books by faculty and staff members, students and alumni of the university. We’ll also feature interviews with writers, and scholarly commentary on publishing trends. 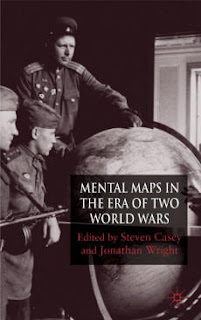 At this week's research seminar, Dr Steven Casey (London School of Economics), co-editor of Mental Maps in the Era of Two World Wars (Palgrave, 2008), will be talking about "The American Home Front and China's Intervention in the Korean War, November 1950-April 1951." Monday November 24, Arts 2.51, 5pm. All welcome. 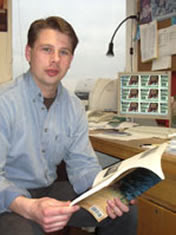 At this week's research seminar, Professor Martin Halliwell (University of Leicester), author of numerous books including Images of Idiocy (2004), will be talking about "Combat Fatigue, American Psychiatry and World War II." Monday 10th November, A2.51, 5pm. All welcome. Last Thursday, October 30th, Nobel prize winner Toni Morrison returned to Norwich to give a reading from her latest novel, A Mercy. A guest of UEA’s Literary Festival for the third time, Morrison drew in a packed lecture theatre as she discussed the enduring legacy of slavery, a theme which runs throughout her work, growing especially prominent in what is now her ninth novel. In his introduction to Morrison on Thursday evening, Professor Chris Bigsby spoke of “the curse of slavery and its aftermath that ricochets through the centuries.” Morrison’s work delves beneath a surface portrayal of slavery, recognising that the enduring effects of this institution still continue to resonate today. Truth, Morrison identified, is the most important element within life. Thus, if memories of the past become disturbed or erased then it is impossible to move forward until this has been rectified. Slavery and racism she likened to “a married couple.” The flux and uncertainty that rocked the U.S. during the years of slavery is mirrored now in the endurance of racism in the twenty-first century. 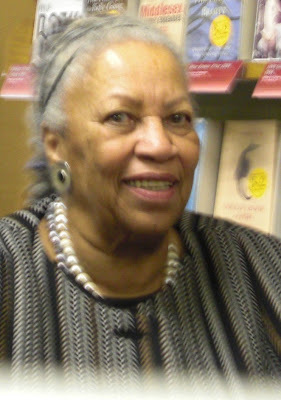 It is for this reason Morrison sets her novels in the past, acknowledging that it provides an infinitely rich source material, whilst also comprehending that it is only through addressing the fundamental issues of race, those issues that remain engrained within U.S. culture today, that one can look to progressing towards the future. Morrison was, of course, speaking on the eve of one of the most publicized and controversial presidential elections in history, and there was a palpable sense that the road to change was opening. As Morrison put it, “the pieces are available, they are just not yet fused.” She nationally publicised her vision for the future earlier in the year in a letter of endorsement to President Elect Barack Obama. As Morrison revealed on Thursday night, “I am holding your hand all the way.” No one is alone in this battle any longer. Morrison writes both to, and for, the entirety of America, as well as the global community. In the wake of Obama's victory, Morrison's hope that the progress of African-Americans can no longer be held back forever seem vindicated, now that the legacies of the past are being re-acknowledged and addressed. The UEA Literary Festival, now in its seventeenth year, is run each autumn semester by the Arthur Miller Centre for American Studies. Guests this year have also included Cherie Blair, Geraldine Brooks and David Gutterson, whilst in the upcoming weeks Richard Holmes, Sebastian Barry and Juan Chang will be presenting their works. For more information and ticket enquiries please contact the UEA box office. Furthermore, recordings of selected previous guests can now be found here. Next, where are you going to get your results? Huffington Post has a whole host of solutions, though CNN might be the best looking pick. Stay tuned though: Containing Multitudes is going to host an automatically updated google map that will keep you on point with events as they happen. And when are they going to happen? If things fall right, it could be pretty soon. Over at FiveThirtyEight you can find out what we might know by 7pm. Still jittery? You can remind yourself about the journey so far at the New York Times or review a musical timeline of the campaign at Drowned in Sound (or examine musicians' campaign contributions at Passion of the Weiss. You could also give some thought to your election day playlist - "A Change is Gonna Come" might be a popular pick. Yet more? Find out what goodies American voters have been promised at the New York Daily News. 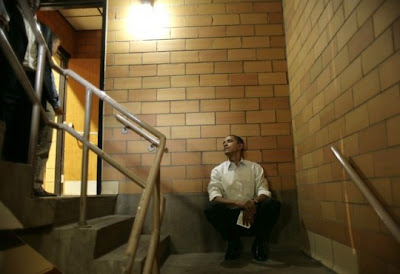 And one final story: "Barack Obama for President", by Andrew Sullivan at the Atlantic. UPDATE: If you want some more laptop distractions whilst watching the rolling results, the BBC is liveblogging the election here. But most compelling is Twitter's election site - updating each and every second as soon as someone mentions the election. And boy, are people mentioning the election. History in real time. Yard signs dot neighbourhoods, campaign ads fill commercial breaks, news schedules are filled with stories of candidates’ state-hopping and polling data. The election is well and truly upon us. Tuesday will see voters electing candidates to a number of positions, with a ballot paper that can take up to ten minutes to complete. The electorate will also decide on Amendment 2 to the state’s constitution, similar to California’s Proposition 8, which would define marriage only as between one man and one woman. If the amendment achieves the support of sixty percent of voters, it will become part of the Constitution of Florida. Despite the plethora of positions to be filled - members of Congress, local Sheriffs and Supervisors of Elections - it is unsurprising that the Presidential race is the most discussed and debated. Here in Florida, one of the 'battleground states', the outcome is of particular interest. Florida is one of a handful of states for which the result is not already a largely foregone conclusion (although polling in even some of the traditionally strongly red states, like Indiana, is indicating the possibility of major gains for the Democrats). 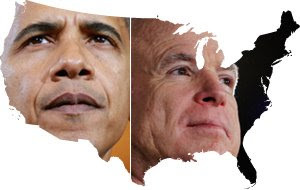 Candidates are keen to keep campaigning here until the last moment: both Obama and McCain and each of their running mates having visited the state in the past week. As home to a high proportion of Latinos, who have tended to vote Democrat (with the exception of Cuban-Americans, who tend to vote Republican), Floridian campaigning materials and ads in Spanish are widespread, such as Obama’s ‘¡Basta Ya! Unidos Por El Cambio’ (‘Enough Already! United for Change’). 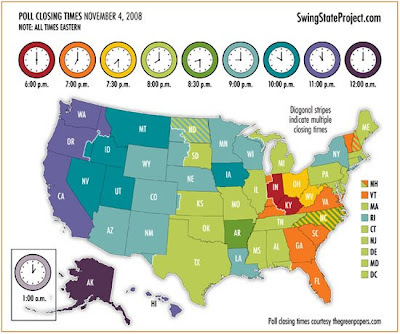 The state’s large retiree population has also been targeted, through initiatives like ‘The Great Schlep’, a movement organised in part by the Jewish Council for Education and Research, in which young Jewish Americans have visited their grandparents in Florida to encourage them to vote for Obama. The state has gone Republican in all but one of the last four Presidential elections, with 2000 being one of the most memorable and fiercely contested battles in the state’s history, eventually coming down to a ruling by the United States Supreme Court in Bush v. Gore. Polling data currently indicates a lead for Obama of a few percentage points, although McCain-Palin yard signs in more rural areas and a notable presence on car bumpers show that they are not without support here. Only Tuesday night will show us which way the state has swung. I took the opportunity to visit the Democrats of Osceola County Obama Office in Kissimmee three days before the election to witness some of the campaigning first-hand. Nilsa, a mother of ten (four her own, three adopted and three more raised by her! ), originally from Puerto Rico but resident in the US for 50 years, has been volunteering at the office since the beginning of August. I asked her, a first-time campaigner, how and why she got involved this time. She first explained that her children have now grown-up and she has recovered sufficiently from recent heart surgery. When she was invited to volunteer, she initially spent just a few hours working in the office, gradually getting more and more involved, to the point where she now feels out of place at home. As we spoke, the campaign office bustled around us, with phones ringing, yard signs being carted through the building and a whiteboard saying that home-cooked food for those working on the main volunteer floor upstairs would be greatly appreciated. The diversity of Democratic support was demonstrated by the variety of materials around the office and the parking lot outside, with posters and bumper stickers bearing slogans like ‘Women for Obama’ and ‘Arab-American Democrat.’ One of the volunteers sported a ‘Teamsters for Obama-Biden’ t-shirt. “Rosa Parks sat so Martin Luther King could stand. Martin Luther King stood so Barack Obama could run. Barack Obama ran so our children could fly” – from a leaflet in the campaign office. Five times a day I'll still say to someone, "I don't know what I'm going to do if McCain wins." Of course, the reality is I'm probably not going to do anything. What can I do? I'm not going to kill myself. If I didn't kill myself when I became impotent for two months in 1979, I'm certainly not going to do it if McCain and Palin are elected, even if it's by nefarious means. If Obama loses, it would be easier to live with it if it's due to racism rather than if it's stolen. If it's racism, I can say, "Okay, we lost, but at least it's a democracy. Sure, it's a democracy inhabited by a majority of disgusting, reprehensible turds, but at least it's a democracy." If he loses because it's stolen, that will be much worse. Call me crazy, but I'd rather live in a democratic racist country than a non-democratic non-racist one. Stay tuned for an election day special. Seattle, the oldest and biggest city in the Pacific Northwest, was our destination as we left campus in minivans at five-thirty in the morning. As part of fall break, the international student group of Reed College had arranged a day trip to Seattle, and twenty-eight of us made the uneventful four-hour trip up Interstate Five between Portland and ‘The Emerald City’. Seattle is the third American city I have seen, after New York and Portland, and the immediate impression when we arrived downtown was that Seattle was more like the former. The tall buildings and wide roads of the business district were much more reminiscent of midtown Manhattan than of any area I have yet seen in Portland. Our first stop on the tourist trail was the Space Needle, Seattle’s landmark ‘pointy tower’ built for the 1962 World Fair. From the observation deck, which is above a rotating restaurant that sells $25 salads, we could see all of downtown Seattle and some of Puget Sound, the network of inlets and rivers to the west of the city. We could also see the Olympic sculpture park that we later visited, a free outdoor collection of sculptures on the river bank. In the same complex as the Space Needle, reached by a monorail, was the Experience Music Project, a rock and roll memorabilia museum celebrating the musical heritage of a city called home by both Jimi Hendrix and Kurt Cobain. The rest of the day was spent exploring other areas of downtown, along with the Gasworks park in the Fremont district, a hilly park built around the site of a still-standing redundant gasworks, and the University district in Northeastern Seattle. The area, known as the U district, felt infused with the University in all its aspects in a way completely different from UEA and its surrounding environment. By the end of the day, the whole group was exhausted, but we still felt as if we had seen only a small amount of what Seattle had to offer. What we did see of the city made it seem a very welcoming place, with a recognizable, walkable downtown full of the coffee houses that are such a cliché of the region. Our impressions may have been helped by the fact that another cliché of the region, rain, was unseasonably absent on the day we visited. However, Seattle still appeared as a lively, friendly, green city worthy of its popular status in the ranks of America’s metropolises. Hip Hop is a concept that carries multiple meanings. Perhaps because of this we feel compelled to subcategorise the genre endlessly. My iTunes player currently lists countless variations on the theme that is Hip-Hop: I have Old School, Hip-Hop/RnB, Electro-Hop, Cocaine Rap, Gangsta Rap, Crunk, Horrorcore, and Jazz Rap - and many more. Recently, though, something new appears to be cropping up all over the blogosphere and filling my computer with two interesting new subgenres: Hipster Hop and Hipster Rap. To examine this new wave, we're going to concentrate on one of its main players. The Cool Kids have just dropped their first physical release (on a record label and everything) after amassing a vast internet created fan base. Despite reservations from some, the Bake Sale EP has been largely met with critical acclaim - critical acclaim, indeed, from particularly areas of the internet. Both pitchforkmedia.com and cokemachineglow.com gave the EP glowing reviews, meaning that their target demographics (young, white, educated and indie) who had somehow missed the hype became aware of them. The effect that this has on the market place is significant: it introduces individuals from social groups not traditionally affiliated with hip-hop to the medium. As Chuck, one half of The Cool Kids, notes: “That is probably the biggest accomplishment we could've done, to take people that wouldn't necessarily have been at a hip-hop show and they'll enjoy it, not just watch.” Cross over appeal has, for the longest time, been the mainstay of popular hip-hop, but this kind of underground momentum represents a growing area within American culture. The internet has forced musical elitism into decline, it is hard to be obscurist when the freshest, newest and strangest underground music is merely a google search away. Independent music is, for the first time, so accessible that the tag has lost some of its former meaning. Indeed the only way to have truly au contraire musical tastes is to reclaim what was once considered uncool. Hence 80s nostalgia. Hence the bizarre cross genre spanning of MIA and Santagold (or anyone from the Diplo/Switch stable) and the current view that this is acceptable. The Cool Kids are all about nostalgia and reclamation. Old School beats, “we’re bringing 88 back” and the classic tagline of “new black version of the Beastie Boys” cement their sound in a very specific period of hip hop’s development. Critically different are the thrust of The Cool Kids lyrics. Unlike most of the hip hop their sound emulates it is entirely without political agenda. Think Public Enemy without the enemy part. It seems that 21st century youth culture, particularly (though not only) in America, is growing increasingly uncomfortable with divisive, politically charged music. The war in Iraq produced few memorable protest songs; Barack Obama’s white house struggle has been marked by a wealth of rallying gigs but the music played lacks the head on qualities that typified 60s protest music (even if hip hop has responded to the campaign in a variety of ways); Live Earth was boring and hypocritical. The Cool Kids fit into this ethos of apathy well. They bring an escapist element that is easier to bear then the grinding drones of ill informed, juvenile protest songs. Our generation’s protest is that of the basement party. In the face of impending economic crisis, hip hop shifts from a fetishism of money to a fetishism of cool. Gangsta Rap is over, and its logical conclusion is a more accessible form. Surely a band that calls themselves The Cool Kids are an evolution of the posturing of the last era. Whereas late 90s/ early noughties hip hop was often concerned with wealth, gain and the material, The Cool Kids are more transcendental. They even tease the intense jockeying that typified the last wave of hip (check: “I can go catfish fishing and come up with a whale”). The focus has become being cool, knowing what is cool before anyone else, being a cool kid. And The Cool Kids are cool kids.